Ahmed Shafiq - Who is Ahmed Shafiq? 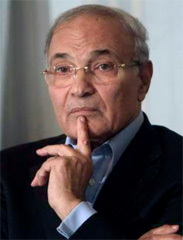 A man of military background, Shafiq has extensive connections to the Mubarak dictatorship. He was nominated air force commander in 1996, and then became Mubarak’s Civil Aviation Minister from 2002 to 2011. On 29 January 2011, five days into Egypt’s mass protests and 13 days before the fall of the regime, he was appointed Prime Minister by Mubarak and remained in power even after the dictator’s resignation, but the continued protests forced him to resign in March 2011. He now stepped back on the political scene, although facing 35 charges of corruption related to his years as Civil Aviation Minister. Some believed he was a possible candidate representing the SCAF’s interests, but this week the military showed otherwise by signing its approval to a new Parliament law taylor made to make Shafiq’s candidacy illegal. The Presidential Elections Commission, however, accepted Shafiq’s appeal, allowing him to continue the presidential race.